Kashmir continued to be on the boil with six more people, including a cop, getting killed in the violence on 10 July raising the death toll to 23, even as curfew-like restrictions were in force and mobile internet services remained suspended. - Amarnath Yatra remained suspended for the third day from Jammu due to the Kashmir unrest in which over 200 people, many of them police and security personnel, have been injured. However, the yatra from the base camps in Kashmir continued. - Over 5,000 pilgrims are stranded without basic amenities. - Mobile, internet and train services remain suspended. - The Jammu and Kashmir Cabinet, headed by Chief Minister Mehbooba Mufti, met and expressed anguish over the situation and the death of civilians in clashes with security forces in the aftermath of the killing of Hizbul Mujahideen commander Burhan Wani. - The government promised to investigate if there was any instance of disproportionate use of force by security forces even as it appealed to the people to not become tools in the machinations of instigators of violence. - The Cabinet also appealed to separatists, including Hurriyat Conference, as well as mainstream political parties like National Conference, Congress and CPI(M) to help restore normalcy "if they want peace in the state". - In Delhi, Union Home Minister Rajnath Singh reviewed the situation that has developed in Kashmir and spoke to Mehbooba Mufti, assuring her of all possible help. - The state police also urged protesters not to resort to violence, saying it does not bring the right consequences, and that it would like to avoid the killing of youth. - Even as curfew-like restrictions remained in force, violence was reported from a number of places. - Police driver Feroz Ahmad was killed after a mob pushed his mobile bunker vehicle into river Jhelum at Sangam in Anantnag district, officials said. Efforts were on to fish out the body of the deceased cop. - In another incident, a head constable of police was shot in both legs by militants at his residence in Tral area of Pulwama district, the official said. 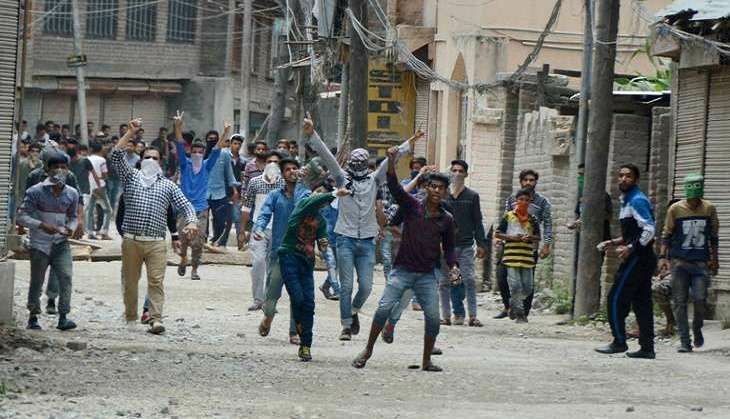 - Three policemen, who went missing after a large mob attacked a police station in Damhal Hanjipora yesterday, are still untraceable, said state Education Minister Naeem Akhtar, who is the government spokesman.